FutureAdvisor is a robo-advisor founded by former Microsoft engineers in 2010 and has approximately $1 billion in assets under management. Based on age and risk profile, FutureAdvisor automates portfolio management by applying modern portfolio theory to create balanced portfolios. Unlike most other robo-advisors, FutureAdvisor assets are not held in-house but rather at established custodians, TD Ameritrade and Fidelity. The best way to think about FutureAdvisor is as the management layer added over an existing account. FutureAdvisor’s portfolio management service monitors, rebalances and tax-manages investments. Management fees charged by FutureAdvisor are 0.5% with a $10,000 account balance minimum, both of which are competitive when compared to human financial advisors. FutureAdvisor also features free tools, tax-loss harvesting and retirement analysis though clients should be aware that transaction costs may be passed on when rebalancing, especially the first rebalancing which may require selling existing holdings. Fee conscious investors will find that FutureAdvisor is not the cheapest of technology-powered investment managers – Betterment ranks more competitively – but FutureAdvisor does cater to tax-aware investors by incorporating tax-loss harvesting methods into its automated portfolio management as well as offering free portfolio analysis and free automatic rebalancing on managed accounts. FutureAdvisor serves self-directed investors who want portfolio recommendations as well as hands-off investors who want a fully automated portfolio management solution. For self-directed investors, FutureAdvisor recommends portfolio adjustments on accounts held at any broker at no cost. The trade suggestions are based on modern portfolio theory and can be executed by the self-directed investor. Investors looking for a less hands-on approach can take advantage of FutureAdvisor’s premium service that automatically manages the portfolio with no input needed, albeit with human oversight of each transaction. FutureAdvisor also has a clear focus on retirement but oddly doesn’t accept new retirees over age 68; existing clients that reach that age are still served. FutureAdvisor charges a competitive fee given its comprehensive investment management solution, but has a higher account minimum than some other advisors, such as Personal Capital. For its 0.50% management fee, FutureAdvisor manages a portfolio based on modern portfolio theory, automatically rebalances the portfolio, employs tax-loss harvesting to optimize the tax efficiency of the portfolio, and connects clients to live financial advisors. Management fees for assets under management are in addition to investment expenses charged by funds to which assets are allocated; it is generally standard practice among robo-advisors to pass on these investment expenses. Like other robo-advisors, FutureAdvisor leverages the Nobel Prize winning academic research of Modern Portfolio Theory, as well as the Black-Litterman model and Fama-French Five Factor Model. FutureAdvisor delivers a comprehensive wealth management solution by focusing on the long-term and diversifying assets according to modern portfolio theory. Based on age, risk-appetite, income needs and other factors, FutureAdvisor custom builds portfolios designed to meet retirement goals. The composition of the portfolios includes exposure to both domestic and international markets. FutureAdvisor seeks low expense ratio index funds to minimize the impact of fees on portfolio returns. Some low-fee index funds can have expense ratios as low as 0.04% compared to mutual funds that often charges fees north of 1%. Smart rebalancing is applied to portfolios and FutureAdvisor claims that from 1992-2002, portfolios subjected to smart rebalancing outperformed the market by 0.4% per annum. FutureAdvisor pays special attention to the impact of tax on returns by identifying tax-savings opportunities daily. Tax-loss harvesting allows investors to save money by deferring taxes, sometimes indefinitely. For example, if one investment falls in value, FutureAdvisor can sell the position to realize the loss and use it to offset taxable gains elsewhere in the portfolio. FutureAdvisor connects to third party financial accounts, aggregates the data, and analyzes it to produce recommendations to optimize returns based on risk profile, and to minimize taxes. Like other robo-advisors, FutureAdvisor can link checking, savings, and investment accounts together to produce a clear holistic financial picture. By aggregating data into one place, FutureAdvisor believes it can more intelligently structure a personalized investment strategy using its algorithmic recommendations. Based on age, risk tolerance, portfolio size, time to retirement and other factors, FutureAdvisor creates an investment plan for all accounts. FutureAdvisor connects clients to live advisors, optimizes portfolios for tax impact, automatically rebalances portfolios and relies on established custodians to ensure assets are safe hands. Although account minimums for its premium portfolio management service are high, FutureAdvisor provides lots of free tools to all users. ✅ Live Advisors: FutureAdvisor connects clients to human financial advisors, a benefit not all robo-advisors confer on clients. FutureAdvisor also provides human oversight so that trades in portfolios are monitored by real people. ❌ Costs: FutureAdvisor passes on investment expenses and transaction costs to clients, in addition to its annual management fee of 0.5%. Compared to SoFi this fee is high but relative to other advisors such as Betterment and Personal Capital, who also connect customers to live advisors, it’s in the same ballpark. ✅ Tax-optimized Portfolios: FutureAdvisor offers tax-loss harvesting in all managed accounts to optimize for after-tax returns. ❌ Retirees Not Permitted: New clients above age 68 are restricted from opening new FutureAdvisor accounts due to their typical focus on income versus returns. ✅ Free Account Analysis: Even non-FutureAdvisor accounts can benefit from the free portfolio analysis tool provided which analyzes portfolio compositions and makes free trade recommendations based on modern portfolio theory. ❌ High Account Minimum: Compared to Betterment, which has no minimum for its pure robo-advisor service, Betterment Digital, FutureAdvisor has a high account balance minimum of $10,000. Some other wealth managers, such as SoFi, manage the first $10,000 at no cost. ✅ Established Custodians: FutureAdvisor accounts are held at established custodians, TD Ameritrade and Fidelity. Account holders at those brokers can try out FutureAdvisor at no cost and without the hassle of transferring funds. ✅ 401(k) Management: 401(k) retirement portfolios above $10,000 held at Fidelity are managed at no cost by FutureAdvisor. FutureAdvisor has competitive fees compared to other robo-advisors and substantially lower fees than most traditional personal financial advisors. 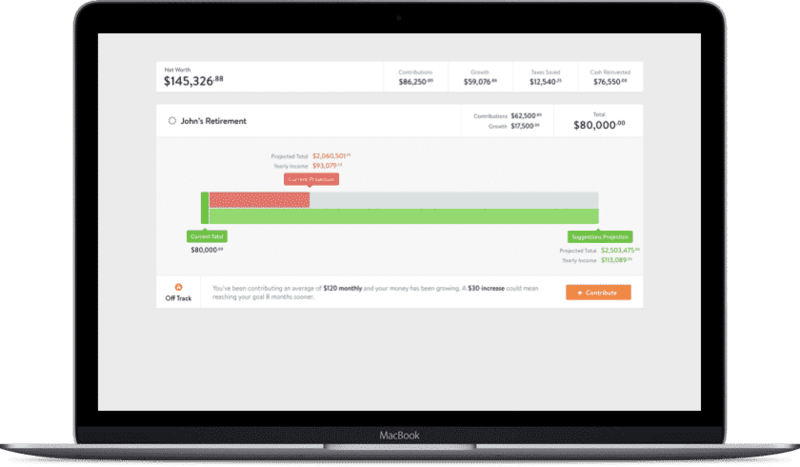 FutureAdvisor manages 401(k) accounts at Fidelity at no cost in addition to managing individual and joint non-retirement accounts and IRAs, similar to most other robo-advisors. FutureAdvisor automatically rebalances portfolios and conducts daily tax-loss harvesting on non-qualified managed accounts. FutureAdvisor acts as an automatic management layer on top of a portfolio while still providing access to live advisors. Existing clients at Fidelity and TD Ameritrade are eligible to try out FutureAdvisor at no cost and without the hindrance of transferring assets. Others will need to transfer assets to either custodian firm, TD Ameritrade or Fidelity, in order to enjoy FutureAdvisor’s premium portfolio management service. However, it’s possible to get free trade recommendations by linking any account to FutureAdvisor as well as to assess current status relative to retirement goals.